Basic barbell programmes are the key to strength. Of course there are various and lovely benefits to bodyweight training, kettlebells, sandbags, yoga and so on, but for just getting strong in a ‘lifting big weights’ kind of sense, you can’t beat barbells. The classic strength builders like squat, deadlift, power clean, overhead press are all best performed with a barbell. Yes, even Paula Radcliffe squats – quite heavy as well! A barbell programme is the best way to get strong legs, a strong back, strong upper body and a strong core. The stronger you are, the easier it is to do athletic things. ‘Basic’ doesn’t necessarily mean ‘beginner’ or ‘newbie’ either. It means simple and effective. A basic barbell programme could be ideal for, say, a powerlifter who wants to get back to basics for a while, as well as an athlete needing to build strength for their sport in the off season. These are basic requirements but sadly many so-called gyms can’t fulfil them. If you have access to a decent strength and conditioning facility at a sports club or university you will probably be fine, but if you just go to your local high street chain gym, you may struggle. If your gym doesn’t have barbells and racks, my advice is: leave and never look back. If you are serious about your training, find a gym that takes your training seriously and can provide you with the basic equipment that folks have used for hundreds of years to get strong. Or invest in your own kit for home. It’s that simple. As a rule of thumb, beginner means someone who is in their first year of barbell strength training; intermediate is someone with a year or two of barbell training under their belt; advanced is someone who has been training for years. The main difference between beginner programmes and intermediate or advanced programmes is that beginner programmes assume progression (increase in weight or reps) from session to session. At some stage progression every session will no longer be possible (as you get closer to your strength potential) and you then need a programme that includes progression from week to week, or from cycle to cycle. If you only train with barbells once a week, or you’ve never done a strength-focussed programme before (as opposed to a bodybuilding programme), then you might be a beginner in strength terms even if you have been training for a couple of years or more. You’ll notice that all of these programmes feature sets of between 1 and 5 reps. This is the ideal rep range for strength building. 5 rep sets are long enough to get good technique nailed and for strength adaptations to occur. You can also build mass with 5 rep sets. If you’ve not done 1-5 rep sets before, you’ve probably not done a strength programme before. I’ll come back to this beginner-intermediate distinction at the end, but in the meantime, let’s take a look at the programmes. Starting Strength is an excellent beginner programme – although Stronglifts (discussed below) might suit you better. Starting Strength can also be good for intermediates who are still making progress on a linear programme. It is good partly because of the structure of the programme and partly because of the wealth of guidance and technical knowledge contained in the book. It allows you to teach yourself good technique and safe, effective training practice. Likewise, anyone who has been away from training for a while, or has only ever had informal tuition in the barbell lifts learning from people around them, will probably benefit hugely from the technical guidance in Starting Strength. I’ve been training for years and I still refer to it. It is a 3 day a week programme featuring the squat, deadlift, bench, military press and power clean. You squat every session and alternate the other lifts. Sets are 5 reps, but this is not a 5×5 (5 sets of 5 reps) programme; the number of sets changes depending on the lift you are doing. For example, Rippetoe believes that the squat benefits more from ‘sets across’ (several sets at the same weight) than the deadlift, which is better done as one heavy set. Alternating these sessions three days a week means that one week you do Workout A twice and the next week you do Workout B twice. Why is Starting Strength good? It does what it says on the tin. It is simple to follow and comes with excellent technique advice in the book. It will potentially last you a long time; you can continue to build strength and/or mass for months or years with this kind of programme. There is also an active forum (and many other popular forums have Starting Strength threads) so support and motivation is only a click away. You might get bored if you are used to doing lots of different exercises and ‘mixing up’ your programme every six weeks as many PTs like you to do. But if that is the case, you need to change your mindset because getting stronger is all about plugging away at a few key movements. Use the numbers as your motivation and enjoy mastering these big movements. The power clean is harder to master than the other movements, being a more technical lift. 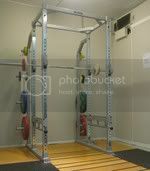 It’s a great lift to learn but if you are not keen to take it on, Stronglifts (below) is a good alternative. Some people also substitute the barbell row for the power clean on Starting Strength. You’ll need the book (a good investment if you are serious about your training), and perhaps the Wiki. The book contains all the technical guidance and the concepts behind the programme but it doesn’t contain an actual template programme. There’s enough information in the book for you to create your own programme if you want, but if you would rather not, you can refer to the Wiki for programmes that Rippetoe and others have written using the Starting Strength concepts. Stronglifts is very similar to Starting Strength in structure, but packaged differently and aimed at a more looks-conscious crowd. The tagline is ‘build muscle and lose fat’, rather than ‘get strong’, although Stronglifts will get you strong as well, if you’ve not really trained strength before. You might be more motivated by ‘look good naked’ rhetoric than ‘get awesomely strong’ rhetoric. There is also more information on the Stronglifts website about nutrition and losing fat than there is in Starting Strength. Most of the ebook is written in an FAQ style which is easy to read and gets the information over effectively. The ebook itself doesn’t contain any ‘how to’ information on technique but all of this is available on the website. It’s not as technically comprehensive as Starting Strength – but then, few books are. Like Starting Strength it is a 3 day a week programme featuring the squat, deadlift, bench, and various assistance exercises. You squat every session and alternate the other lifts. Unlike Starting Strength, Stronglifts does not include the power clean as a key lift. 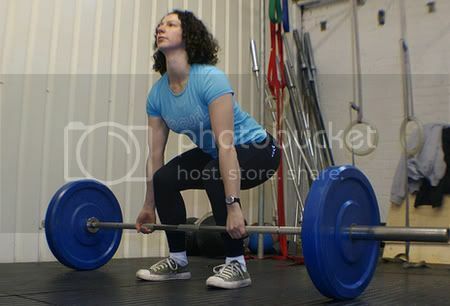 The power clean is rather more technical than squat or deadlift and will take longer to master. Stronglifts includes the technically easier movements of inverted row and pull up/chin up. The set and rep scheme is slightly different from Starting Strength. More of the exercises are 5×5 rather than 3×5, so overall the volume is higher. Like Starting Strength, you alternate these workouts over a three day week. It is written in an accessible way and is easy to follow. There are more exercises included in the basic programme than Starting Strength, so if Starting Strength looks a bit boring you might fare better on Stronglifts. Many people have said that adding weight every workout gets quite difficult within a few weeks or months. Some people also get a bit tired and/or demotivated on the programme because the volume is quite high. Doing 5×5 squats is much more demanding than doing 3×10 bicep curls! Although there is an online community around the programme, it is now members-only. As far as I know, it is still free, but only opens to new members periodically, so it may be a while before you can join. It is quick to get started as everything is online. Download the free ebook from Stronglifts.com and read the blog posts for technique info. Jim Wendler is a powerlifter from the infamous Westside Barbell powerlifting gym who underwent a renaissance when he realised that although he had become enormously strong in the competitive power lifts, he was also extremely fat, out of shape and burnt out from lifting. The eventual result of this change in philosophy was a programme which combines strength with some conditioning, can be done around a normal lifestyle and provides simple progression and regular personal bests. The weight you use on the main exercise each week is worked out as a percentage of your max. The programme starts light so that continuous progress can be made. As well as the main exercises, you add in whatever assistance exercises you want (dips, chins, rows, shrugs, good mornings etc). You also add in conditioning such as hill sprints or prowler pushes. It is a classic powerlifting rep scheme, from 5 reps to 3 to 1, but the difference is that you don’t reach your absolute max – instead you try to get more reps at a slightly sub-maximal weight. This means that you get more volume than a traditional powerlifting programme but you still have to work hard at heavy weights, and so you get stronger. There is also the interesting mental challenge of not knowing how many reps you might get on that last set of 1+. Your personal bests become not your one rep max but a rep PB on a particular weight. This also takes the pressure off going to max too often. In fact you might only go to max on the platform. I’ve seen people do this programme and get very high reps on their 1+ day. This is because they haven’t reached anywhere near their strength potential. I’m not convinced that 5/3/1 is the best programme in this situation; although it won’t exactly do you harm either. But Starting Strength or some other linear 3×5 or 5×5 programme is better to build strength first. I would include Crossfitters in this group as many do not do enough strength training in their day to day Crossfitting to be ready for 5/3/1, unless they are coming from a lifting background. For powerlifters this programme might contain more volume than they are used to; but for beginners the volume on 5/3/1 is less than on the other beginner programmes discussed here. 5/3/1 seems ideal for people who have been plugging away with powerlifting or heavy bodybuilding workouts for years and have just stalled. It could also suit someone who is transitioning from ‘normal’ barbell training into powerlifting training, perhaps working up to their first meet. The book does not contain detailed instruction in the lifts but includes good performance tips if you can already perform a squat, deadlift, bench and military press and are familiar with the assistance exercises. If you are happy performing the movements, the book is all you need: it even provides Excel templates and worksheets for you to put your programme together. There are formulas for obtaining your one rep max but you might also want to test your one rep max first. If you’ve done little barbell work before and you are not confident in the main exercises, begin with Starting Strength and save 5/3/1 for when you are at a more advanced level. There are many variations of the basic 5×5 programme out there, so I’m not going to go through all of them. This particular programme is useful because it is clearly set out by Madcow, based on an original programme by legendary American strength coach Bill Starr. The original programme was designed for off season football players, i.e. athletes who need strength and explosive power, and so power cleans and high pulls were included. Madcow presents a version with deadlift instead of high pull and barbell row instead of power clean – more geared to lifters simply focussing on strength and/or mass. 5×5 intermediate is a 3 day a week programme based on squat, bench, press, row, deadlift and assistance exercises. You squat every day. You perform ramping (i.e. increasing) sets of 5×5 on a Monday, 4×5 on a Wednesday and by Friday you are doing a heavy triple, followed by a back off set of 8. That triple becomes your heaviest set of 5 on a Monday. Like the other programmes, it is simple and easy to follow. It contains the big exercises that will cause the greatest strength adaptation and it has you squatting every session. There is a lot of volume but most of it isn’t heavy because sets are ramping. This gives the body lots of time to get fit and strong, and for those with less experience at the lifts, more opportunity to practise technique. If you keep rest periods down, the cardio effect of doing 5×5 is significant. Many people will find it hard to keep adding weight every week, but if that is the case, simply repeat the session until you make all your reps at the new weight. If you have no experience with the barbell lifts, this is not the ideal programme. But if you have basic technique in the lifts, this is a good beginner-to-intermediate programme for lifters and athletes. The details of the programme are found online at Madcow intermediate 5×5. For technique on the lifts, pick up a copy of Starting Strength. The Texas Method is described by Mark Rippetoe in the book Practical Programming for Strength Training and is one of the intermediate programmes following the basic Starting Strength. There isn’t a programme so much as a programming method. Monday is the ‘stress’ day of the week, where adaptation takes place. Wednesday is a lighter day as the lifter is still recovering from Monday. Friday is a high intensity-low volume day where personal bests can be attempted. The exact exercises, sets and reps you choose depend on your goals. For the Friday, for example, you may want to do 1 x 5 one week, 1 x 3 the next week and 1 rep max the week after. You don’t have to do every exercise every day. In fact, according to Glenn Pendlay, Wednesday is not for ‘light’ weights in the main lifts so much as exercises that are easier to recover from or exercises that the lifter is naturally less good at. For example, a powerlifter could do front squat on the Wednesday, since her front squat is likely to be significantly lighter than her back squat. Likewise overhead press can be used instead of bench press or power clean instead of deadlift. Some intermediate lifters may fare better doing only one set of 5 on the deadlift on a Monday, rather than 5×5, especially when squatting the same day. The deadlift being such a taxing lift, it tends not to require as much volume as the other lifts. It is one of the progressions from Starting Strength, utilising principles similar to other 5×5 variations. The format of heavy/medium/light is a type of periodisation, easier to perform and recover from than a programme that demands progress every session. The method is flexible and easy to customise for your particular needs. Practical Programming is an excellent book if you are interested in the general topic of programming, but if all you want is a new programme to start, then getting a book like this is probably not necessary. You might be better off buying Wendler’s 5/3/1 or giving Madcow intermediate a go. This programme is probably best for people who have done Starting Strength and like the Rippetoe approach, but have stopped making progress and need to alter their programming. You will need the book Practical Programming for Strength Training by Rippetoe & Kilgore. You may also want to check out what other people have done on the Starting Strength forum. Unless you are a complete beginner, you probably need to decide whether you need a beginner programme or an intermediate programme. This shouldn’t be a decision based on ego. In fact, you want to stay at ‘beginner’ level for as long as possible, since once your progress stalls you have to try all sorts of programming voo-doo to get it going again. The longer you are on a beginner programme making progress, the more likely you are to end up being a beast! Making a choice between the programmes available will largely come down to packaging and appeal. For example, you might like the Stronglifts approach better than the Starting Strength approach, but both programmes will do what you want them to do. The purpose of this review was to give you an idea of what the programmes are like and a few of the pros and cons, not to rate them or attempt to say which is best. The good news is that you won’t go far wrong choosing any of these programmes. Those who learn good technique, train consistently and work hard invariably go on to achieve great things. The most important thing is to find a programme you like the look of and can stick to. Have you done any of these programmes? Do you have any experiences to share? Hi there to all, since I am in fact eager of reading this blog’s post to be updated on a regular basis. will start to feel healthier and appearance better. heavy metals and GMOs. Since most of us are busy, and unable or unwilling to maintain a strict diet in order to completely eliminate all the toxins from our body. website!I suppose its good enough to use some of your ideas! !